With that in mind, let’s take a look at a few of the things that have confused clients in the past. A recce (sadly?) has little to with the 2007 Spanish zombie movie REC. “Recce” – short for reconnaissance – is the very trendy slang (I like to think it’s trendy, anyway) we use to mean “take a look at a location before we film there” – this usually involves coming in person to check around a location, and taking a few pictures. Shoot days are generally the biggest expense when making a video, so by checking the location out first we can plan how to make the best use of the space in advance (details like the direction the windows are pointing in and the location of plugs can completely change the way we film), meaning we can get the most out of the filming day(s). It also allows us to flag up any problems in advance – common ones are too much noise or too little space (see our blog video “A Room for Filming In” for more on this). On smaller projects, or where budgets are tight, instead of coming up ourselves we may ask you to conduct a recce of your very own on our behalf by sending over pictures of the room and filling out a form with all the key details. 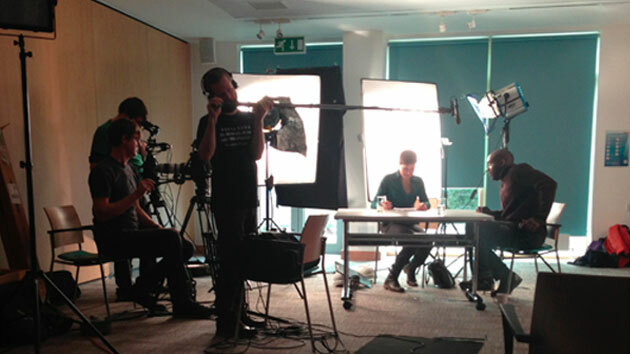 You can, of course, make a video with one person doing everything – lighting, filming, recording sound and directing. However, this approach will limit what is achievable. By increasing the size of your crew, you can have specialists working on specific areas of the video – a director getting the best performances out of the actors/interviewees, a sound recordist setting up the microphones and monitoring the sound so it’s as clear as possible, and so on. Not only can this increase the quality of the content, it also can allow you to capture more, making shoot days more efficient. This is not to suggest that every shoot needs a flashmob-size crew for every project – sometimes a small crew is best (no point squeezing twenty people into a tiny room just to film an interview), and sometimes a little more expertise is needed. Work with your production company to find the best solution for the project you have. If you’re not clear what all those people actually do, check out our “jobs on set” series to find out more. For that matter, why so much stuff? When I made my very first film in high school (a trailer for a non-existent feature called “virus” which was, amazingly, about a virus) we filmed it with a camcorder, and occasionally a tripod if we were lucky. So my 15-year-old self might have been a little confused by the piles of cases we bring along to a standard drama shoot today. What’s it all for? Starting with the basics, there’s the cameras, which, while not as big as the truly hefty monsters you may have seen balanced on a cameraman’s shoulder in the 80’s, are still bigger than my tiny teenage Panasonic camcorder was. Throw in a set of lenses and a tripod per camera and all the sound recording equipment, and that’s already a fair bit of kit. 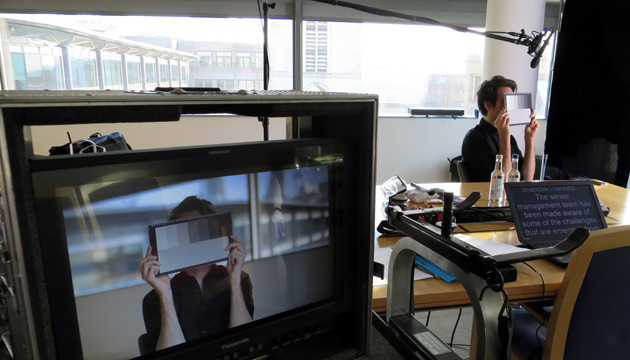 You’ll want to see what’s actually being filmed – partially to make sure the camera operator isn’t just filming their feet, but mainly so you, the director and any SMEs can give your feedback on the process. This means there’ll probably be a monitor, perhaps several if it’s a multi-cam shoot. Next, and perhaps the biggest difference between a professional shoot and my teenage noodlings, is the lighting. Unless you’re filming outside on a relatively bright day, without lighting your video will at best might look a bit gloomy, and at worst may be too dark to actually see what’s going on. Simple lighting for a straight-forward interview will generally need at least three lights (this is for the basic lighting set-up known as “three point lighting”), while filming in larger spaces with multiple people will need more, meaning lights frequently take up the lion’s share of our equipment. At a minimum you’ll also need stands to put all of this on, cables to connect everything up (think you have a lot of cables at Christmas? You ain’t seen nothing), and misc equipment like gaffer tape, used for everything from giving actors marks to emergency equipment fixes. Depending on the needs on the shoot, there can be much more – for example a make-up station, or if costumes are involved there might be an outing for the Nice Media ironing board and clothes rail. As you can imagine, we’re always very grateful when our clients have a service lift or loading bay – saves us an awful lot of carrying. Why do I have to wear make-up? This one can cause a bit of double confusion – from those who are already wearing make-up as to why they have to wear more, and from those who don’t as to why there’s a crew member coming towards them brandishing a big fluffy brush. Unless you normally go about your business with spotlight on you, when being filmed you’re under lot more lighting than you would be in day-to-day life. Basic make-up – generally a dusting of matifying powder – is used to counteract the effect of these lights on your skin – basically, making you look as you normally do. We may even go further than that and put some tinted powder on you to even out your skin tone, or concealer if a spot has kindly showed up at the worst possible moment. The intended outcome is to make you look your best – nobody wants to have a record of the day they were looking a bit rubbish (unless that’s the intention). That’s only a small selection that come up a lot, but there’s plenty more. What parts of production do you find confusing? Comment below or tweet us @NiceMediaUK – we’re always happy to blather, I mean, help.